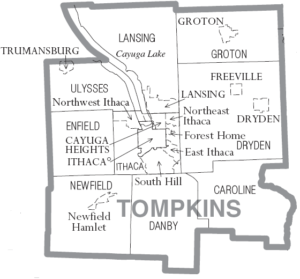 Population: Tompkins County (population 103,617) is located in upstate New York’s Southern Tier. Ithaca, Tompkins County’s largest city (population 30,720) and county seat, lies in the center of numerous local municipalities (nine towns, six villages, three hamlets and six census designated areas). Incarceration Rate: Unlike neighboring counties where both jail and prison incarceration has skyrocketed since 1970, the incarceration rate in Tompkins County has held steady during the past thirty years. Deborah Dietrich, Executive Director of OAR, suggests that the relatively low jail and incarceration rates in Tompkins County may be due to progressive city and county judges and a vigorous Probation Department supported by a progressive legislature. However, more work remains to be done with uneven sentencing originating in the townships with non-attorney magistrates. Tompkins County Jail: TCJ is a small rural county jail with an average daily population of 90 and a yearly population of just under 900 distinct individuals. An additional 250 persons on probation serve Alternative to Incarceration (ATI) sentences yearly. The majority of sentenced individuals at the TCJ are charged with misdemeanor offenses, spending an average of 35 days in the jail. Pretrial detainees, who make up 62 percent (or more) of the jail population, can be incarcerated for a year or more while going back and forth to court appearances. Of those sentenced individuals, 18% are female, 82% male, 17% African American (Tompkins County African American population is 4.4%), and nearly 80% white (white population is 81.5 %).